The 2013 Vosne-Romanee 1er Cru Aux Brulees was matured in 50% new oak and 50% one-year old. There is just a very slight reduction on the nose, but otherwise there are appreciable pure black cherry and iodine scents that waft from the glass. The palate is medium-bodied with fine, quite supple tannin. This feels silky in the mouth, very harmonious with blackcurrant and boysenberry jam on the intense finish. Very fine Michel! The 2012 Vosne-Romanee 1er Cru Clos des Reas, Michel Gros’s famous monopole to the south of Vosne-Romanee village, has a complex, mineral driven bouquet with black rather than red fruit, touches of gingerbread and marmalade loitering with intent in the background. The palate is medium-bodied with supple, fine tannins and good purity of fruit. It is harmonious and focused with a gentle build to what feels like a structured, saline finish reminiscent of the sea. This is a very fine Clos des Reas: one of the finest and perhaps overlooked premier crus of the appellation. The 2014 Clos de Vougeot Grand Cru has a fresh, well defined, quite elegant bouquet with lucid ripe red cherries and a touch of orange sorbet that blossoms in the glass. The palate is well balanced with supple tannin, a fine thread of acidity, very harmonious with very good precision on the finish. 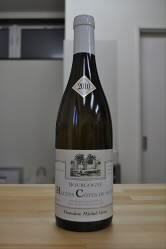 I think this is one of the best Clos de Vougeot that Michel has produced.